Portable yet strong 2 hole punch in trendy two-tone colours. 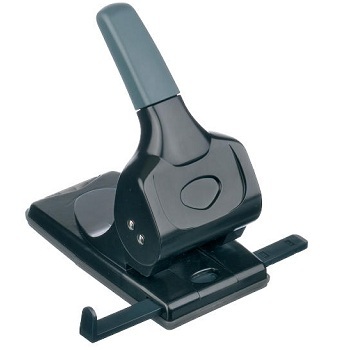 Compact hole punch with handle and base in reinforced ABS plastic. Adjustable paper guide. Centre mark for easy lining up of paper. Suitable for home and school use. 2 Hole Punch. Capacity - 10 sheets. Available in a choice of funky colours. Colour coordinated with Rapid Funky F6 Staplers. Take the hassle out of punching... Premium Leitz® fashionable hole punches are robust and reliable. Patented grip zone and ultra sharp pins for reduced punching effort. Adjustable paper guide. Easy to empty, hinged waste box. 2 Hole Punch Stapler. Capacity - 30 sheets. Vibrant colors and a polished aluminum finishes let you stand out from the crowd. 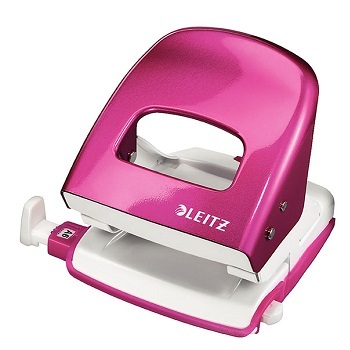 Colour coordinated with Leitz NeXXt WOW Staplers. Durable plastic construction two hole compact sized punch. Complete with click stop paper guide and flip-top base for easier emptying. Punches holes of 5.5 mm diameter - 80 mm apart. 2 Hole Punch. Capacity - 12 sheets. Durable plastic construction two hole medium sized punch. 2 Hole Punch. Capacity - 20 sheets. The most popular premium quality punch in Australia. All OPEN punches are made from strong but light pressed metal. Plastic base to protect your desk surface and to act as storage for waste punchings. Clear, positive action which includes centre indicators for accurate punching. 2 Hole Punch. Capacity - 13 Sheets. Premium small two hole punch. Designed with unique ergonomic features, which make using the punch simple and easy. All metal robust construction with soft feel material for comfortable use. 5 Year Guarantee. Unique paper alignment indicator - ensures accurate punching every time. Angled base for easy paper insertion. Retractable paper size guide showing all paper sizes. 2 Hole Punch. Capacity - 15 Sheets. Executive, sturdy all metal construction two hole heavy duty punch. Complete with adjustable paper guide and removable base for easier emptying. Punches holes of 6 mm diameter - 80 mm apart. 2 Hole Punch. Capacity - 40 sheets. Strong metal case construction two hole heavy duty punch. Features a switch to lock handle down for compact storage. 2 Hole Punch. Capacity - 28 sheets. Premium medium two hole punch. Designed with unique ergonomic features, which make using the punch simple and easy. 2 Hole Punch. Capacity - 25 Sheets. Premium quality two hole office punch. 2 Hole Punch. Capacity - 24 Sheets. Strong metal case construction two hole maxi punch. 2 Hole Punch. Capacity - 35 sheets. Executive, sturdy all metal construction two hole extra heavy duty punch. 2 Hole Punch. Capacity - 70 sheets. Premium large two hole punch. Designed with unique ergonomic features, which make using the punch simple and easy. 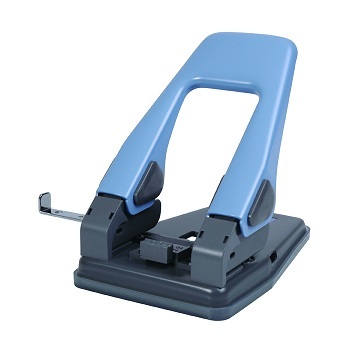 Premium quality heavy duty two hole punch. 2 Hole Punch. Capacity - 30 Sheets. Easy to use extra heavy duty two hole punch. Soft feel rubber handle for easy, comfortable operation. Easy to use flip top base. Lock down handle for compact storage. Click stop paper guide and centring guide. Punches holes of 5.5 mm in diameter - 80 mm apart. 2 Hole Punch. Capacity - 60 Sheets. 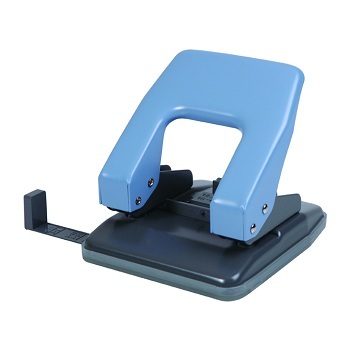 Durable extra heavy duty two hole punch with reliable performance. Robust, die cast aluminium base combines extra strength and leverage with light weight. Plastic base protects your desk and gives a non-slip surface. Paper measuring guide for accurate alignment of paper sizes and handle hold down for easy storage. 2 Hole Punch. Capacity - 65 Sheets.